With the US returning from holiday, US equity futures have sunk to session lows, while stocks in Europe slumped, reversing an early gain as Italian and Spanish bank shares faded and the major London, Frankfurt and Paris bourses faltered; this followed a mirror image in Asian price action, where stocks reversed earlier losses helped by a 1.3% late surge from Shanghai. S&P500 futures have sunk to session lows after trading rangebound since Friday. Nike fell 1.4% in the pre-market after the sportswear-maker revealed its new ad campaign will star Colin Kaepernik who led protests during the playing of the national anthem. The Stoxx Europe 600 index dropped 0.3% after earlier rising as much as 0.4% led by banks, miners and carmakers. Danske Bank retreats as much as 7.1%, ING falls as much as 3.2%. Danske said it is in the process of finalizing an internal investigation into allegations that its Estonian operations were used to launder billions of dollars in illicit funds; separately ING agreed to pay 775 million euros to settle an investigation by the Dutch prosecutor into issues including money laundering and corrupt practices, one of the biggest fines ever given to the country’s banks in a criminal case. Italian government bond yields fell back from three-month highs, with investors encouraged by soothing comments from Italian ministers on forthcoming budget proposals. According to Reuters, Rome’s Economy Minister Giovanni Tria was pushing the governing coalition to keep next year’s budget deficit below 2 percent of output. Deputy Prime Minister Matteo Salvini had said on Monday that it would not breach the European Union’s 3 percent limit. “I would say the overall price action is quite encouraging and Salvini’s comments yesterday gave the market another push,” Commerzbank rates strategist Christoph Rieger said. Asian equities were choppy with the region indecisive as trade-related concerns lingered and after a non-existent lead from the US which was shut for Labor Day holiday. ASX 200 (-0.3%) was negative and fell below the 6300 level as weakness in tech, energy and financials dragged, while Nikkei 225 (unch) swung between gains and losses amid currency fluctuations. 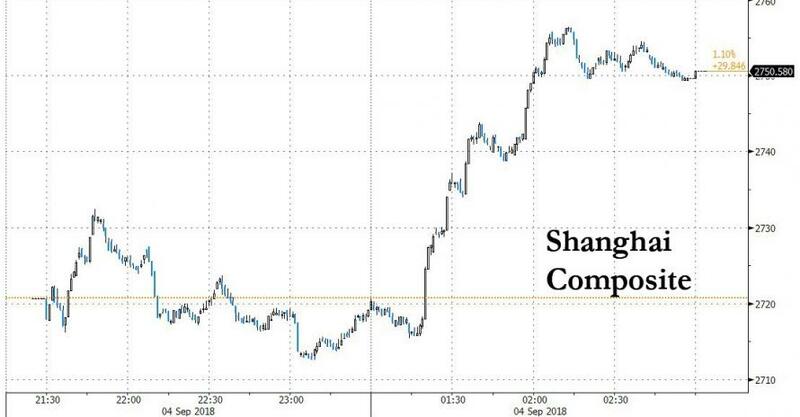 In China for the second day in a row stocks shot up in the afternoon session as the Shanghai Composite Index rose in afternoon trade to head for its first gain in six sessions, with the 1%-plus surges in most major indexes strong enough for traders to start talking about the national team backing the move after Monday's sharp rebound. And, as Bloomberg's Garfield Reyonds notes, it certainly looks sudden enough (and sufficiently motive-less) to make that speculation plausible. If the national team, as state funds are called, is leading the charge, that signals China wants to set the floor higher than the 2,655 area on the Shanghai Composite that sparked intervention on Aug. 20. The fact that they felt the need to move in again so soon also underscores the challenges mainland equities face after sentiment was beaten down so hard this year. 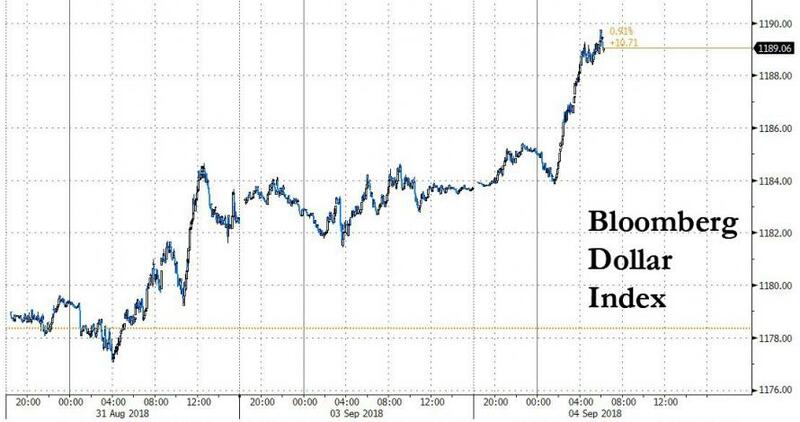 Meanwhile, in a rare failed attempt to intervene in the currency, at least one large Chinese state-owned bank bought a significant amount of one-month USDCNH forwards Tuesday morning, pushing forward points higher and draining offshore yuan liquidity Bloomberg reported. The bank also bought forwards in other tenors shorter than one month. And yet despite this intervention, the offshore yuan failed to move higher, and has been steadily sliding for much of the overnight session as the latest attempt to squeeze the shorts has failed. 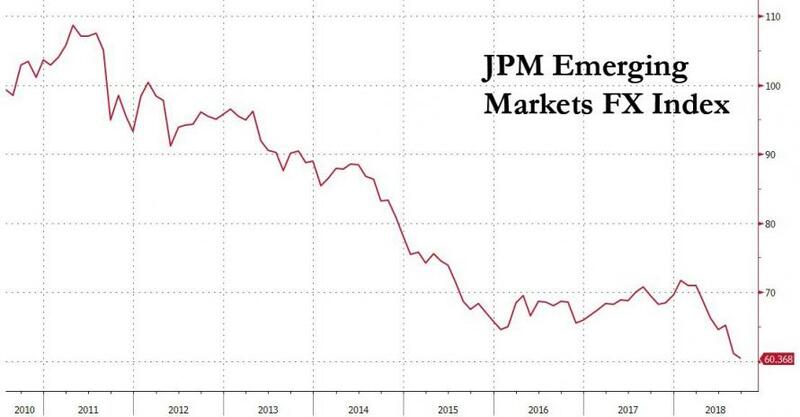 In emerging markets, equities declined for a fifth session with the JPM emerging markets FX index dropping to the lowest level this decade, pulled down by Indonesia’s rupiah and South Africa’s rand. The dollar squeeze continued, with the greenback surging since early London hours as Treasuries and emerging-market currencies dropped amid concerns over global trade. No clear catalyst was cited for the dollar strength with some noting end of U.S. tariff consultation period on Wednesday, possible allocation flows given first effective trading day of the month and catch-up to EM concerns such as Argentina given Labor Day holiday. The Bloomberg Dollar Spot Index rose a fourth day to a more than two-week high as investors remained cautious amid a possible escalation in U.S.-China trade tensions. 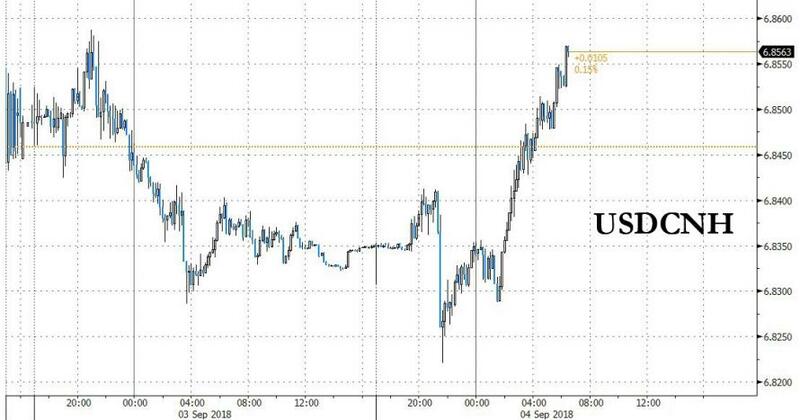 Dollar strength saw the Aussie reverse the gains that followed a Reserve Bank of Australia policy statement which reduced expectations the central bank would become more dovish; the currency had earlier dipped after data showed the nation’s current-account deficit widened. RBA kept the Cash Rate Target unchanged at 1.50% as expected and reiterated that low rates are supporting the economy and that progress on inflation is expected to be gradual, but that it sees inflation higher in 2019. Furthermore, the RBA stated that the labour outlook remains positive and the economy seems to have grown above trend. 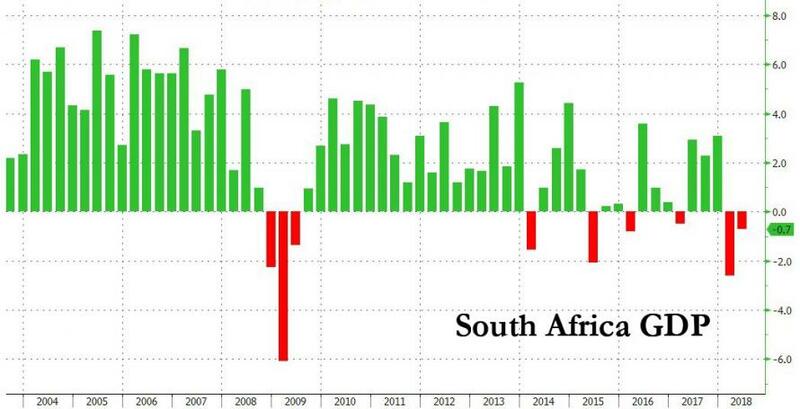 ... with India’s rupee and Indonesia’s rupiah slumping to new record lows in Asia and the Turkish lira, Mexican peso and Russian rouble all skidding again, but the biggest loser was the South African rand, following news that South Africa "unexpectedly entered its first recession in 9 years. Investors are now shifting focus to the U.S., where trading resumes after a holiday during which Argentina’s urgent financial measures increased concern about more volatility in emerging-market stocks and currencies. The jitters may add to the outperformance of developed markets, which advanced during the summer despite trade salvos from President Donald Trump and a Federal Reserve that’s heading toward a late-September rate hike. Meanwhile, Bloomberg notes that U.S. trade negotiators are in difficult talks with their Canadian counterparts over a revision to NAFTA already agreed to by the U.S. and Mexico. On the China front, Trump may announce implementation of tariffs on as much as $200 billion in additional Chinese products as soon as Thursday. In other news, outgoing Mexican President Pena Nieto stated that they didn’t accept quotas or restrictions in the deal with US and that they will participate in trilateral discussions with NAFTA partners, while he added it is important for Canada to remain in NAFTA. Brexit discussions. As a reminder, the Treasury has originally wanted to release the budget at the end of November. In geopolitics, President Trump warned Syrian President Assad to not recklessly strike the Idlib province in Syria, while Trump also said that Iran and Russia would be making a grave humanitarian error and that hundreds of thousands could be killed if they attack Idlib. Russia's Kremlin replied by saying US President Trump’s warning against Idlib is offensive and such warnings are not a comprehensive approach to the problem. In bond markets, expectations that the Federal Reserve will raise U.S. interest rates again later this month pushed the yield on benchmark 10-year Treasury notes to 2.8640%. More sensitive two-year yields, touched 2.637%, compared with a U.S. close of 2.629% last week. U.S. markets were closed for the labor day holiday on Monday. The moves were also helped by rising oil prices. WTI and Brent futures trade on the front foot with both benchmarks above USD 71/bbl and USD 79/bbl respectively. Price action is supported as investors and traders assess the potential threat to US production from tropical storm Gordon that is expected to hit the Gulf Coast (with hurricane warnings in place). Anadarko Petroleum evacuated workers and shut production at two Gulf of Mexico platforms as the storm nears. Elsewhere, due to yesterday’s US Labor Day holiday, the API weekly crude inventories have been delayed until tomorrow. The metals complex was heavily pressured by the strengthening dollar with gold slightly lower as the dollar strengthened, with spot gold traded below $1,200 at $1,195 per ounce, while silver, palladium and industrial metals such as copper and nickel saw more than 1% falls. Asian markets were choppy with the region indecisive as trade-related concerns lingered and after a non-existent lead from the US which was shut for Labor Day holiday. ASX 200 (-0.4%) was negative and fell below the 6300 level as weakness in tech, energy and financials dragged, while Nikkei 225 (-0.2%) swung between gains and losses amid currency fluctuations. Elsewhere, Hang Seng (Unch.) and Shanghai Comp. (-0.1%) also see-sawed as participants contemplated over the potential fresh US tariffs this week and amid CNY price swings, as well as continued liquidity inaction by the PBoC. Finally, 10yr JGBs were marginally higher amid the indecisive trade in riskier assets. However, upside was also capped as participants digested the BoJ’s Rinban announcement in which it upped its purchases of JPY 1-5yr by a total JPY 100bln, which would suggest monthly purchases of those maturities are on track to be reduced to JPY 3.25tln from JPY 3.30tln M/M if the purchase amounts are maintained, considering the recently announced reduction in the number of buying operations for this month. 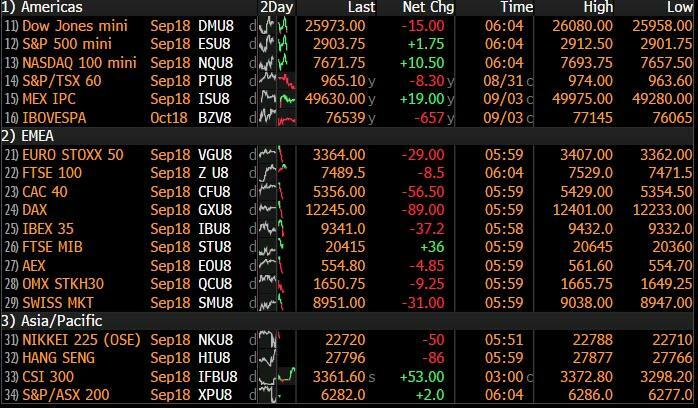 European equities trade mostly lower (Eurostoxx 50 -0.8%), with the core bourses unwinding gains and plunging into the red following a positive open. Italy’s FTSE MIB outperforming peers as the index is buoyed by Italian banks benefiting from BTP price action. Broad-based losses are experienced across European sectors, with energy names lifted by price action in the complex. The Eurostoxx 50 underwent a reshuffle with sources stating Deutsche Bank, E.on and St. Gobain due to leave the index whilst Linde, Amadeus and Kering are to ender the Stoxx 500. Elsewhere, SocGen (+0.1%) is expects to pay USD 1.4bln in fines over allegations of sanction violations, however the bank is expected to pay far less than rival BNP Paribas paid four years ago. In FX, there is a firm rebound in the dollar DXY index to almost 95.600 from lows only a fraction above 95.000 yesterday, and amidst broad gains vs G10 counterparts alongside further outperformance against flagging EMs. Technically, the DXY has near term resistance to aim for at 95.709, but will get further impetus and direction (one way or another) when US markets re-open after the long holiday weekend. EUR/CAD/CHF - All around 0.4-0.5% softer vs the Greenback, with the single currency well below 1.1600+ peaks and through a key Fib level (1.1569), but finding some traction ahead of 1.1500 and the 21 DMA (1.1544), while the Loonie has lost more ground ahead of the next round of NAFTA talks and BoC tomorrow, even though crude prices are bucking the weak commodity trend and in theory supportive. Usd/Cad is hovering just below 1.3150 with decent offers said to be sitting between 1.3160-70, while the Franc has retreated through 0.9700 and hardly flinched at in line Swiss CPI data. 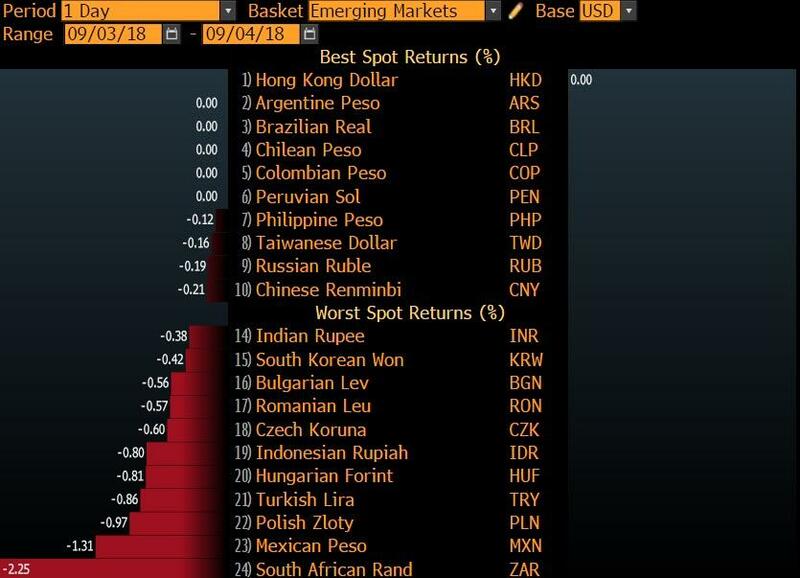 EM - More pain for the likes of the Lira, Peso, Rouble and Rand, with the latter hit even harder following an unexpected SA GDP contraction that means technical recession to compound the misery of domestic political problems and US sanctions. Usd/Zar up over 15.2500, Usd/Try 6.7200+ at one stage, Usd/Rub above 68.3800 and not helped by a non-committal Central Bank Governor ahead of next Friday’s policy meet, while Usd/Mxn is approaching 19.4400 and Usd/Ars is awaiting reaction to tighter fiscal measures announced yesterday. In commodities, WTI and Brent futures trade on the front foot with both benchmarks above USD 71/bbl and USD 79/bbl respectively. Price action is supported as investors and traders assess the potential threat to US production from tropical storm Gordon that is expected to hit the Gulf Coast (with hurricane warnings in place). Anadarko Petroleum evacuated workers and shut production at two Gulf of Mexico platforms as the storm nears. Elsewhere, due to yesterday’s US Labor Day holiday, the API weekly crude inventories have been delayed until tomorrow. In terms of metals, the complex is heavily pressured by the strengthening dollar with gold taking out USD 1200/oz to the downside. Looking at the day ahead, there’s a number of potentially interesting releases in the US particularly in the manufacturing sector with the ISM manufacturing print for August (57.6 expected) and final August manufacturing PMI due. July construction spending data is also due while August vehicles sales data will also be out at some stage. Away from the data the BoE’s Carney is scheduled to testify before lawmakers this afternoon on the August inflation report and policy decision. Also potentially interesting is a possible town hall meeting featuring German Economy and Energy Minister Peter Altmaier who may discuss Europe and US relations, Brexit and China. It’s worth noting today also marks the day that the full US Congress returns. The first business day of September might mark the start of the long slog into year-end but hopes were never really high for it being one of any real entertainment given the US holiday yesterday. Indeed it was a fairly mixed day across most of Europe in the end with the main stories being some divergence across country level PMIs following the final August data, a largely in-line Turkish CPI print but with little sign of respite ahead and a fiscal update from Argentina although both of which failed to stem more weakness across EM currencies including the Lira and Peso. We also had a bunch more mixed headlines second guessing Italy’s deficit target and finally a tough day at the races for Sterling post the weekend’s more Brexit unfriendly rhetoric. More on all those shortly but as far as markets were concerned, the Stoxx 600 clawed back to a +0.07% gain by the end of play after spending much of the session passing between gains and losses. The CAC (+0.13%) did likewise however the DAX (-0.14%) failed to really get out of the starting blocks. The IBEX (-0.24%) also struggled however the FTSE MIB did jump to a +0.62% gain after falling heavily on the final two days of last week. The FTSE 100 (+0.97%) also had its best day in a month inspired by that decent slide for Sterling (-0.69%). There wasn’t much to write home about for bonds with Bunds (+0.7bps) a shade weaker and the periphery (BTPs -6.9bps) broadly stronger. Finally it was another tough session for EM FX led by the Turkish Lira (-1.45%), Brazilian Real (-2.51%)and Argentine Peso (-4.17%). Indeed EM FX as a broad index was down -0.71% and for the ninth time in the last eleven sessions. There’s a similar mixed picture across Asia this morning although moves have been fairly modest by all accounts. The Nikkei (-0.27%) and Shanghai Comp (-0.06%) are both tracking lower while the Hang Seng (+0.03%) and Kospi (+0.20%) are both just about holding onto gains. Futures on the S&P 500 are also +0.10% while Treasuries are little changed. Meanwhile the BoJ announced increased purchases of JGBs in the 1-3 and 3-5 year maturity buckets overnight, compensating for the now lower frequency of purchase operations. So more evidence that the stealth taper is in play. JGB yields are little changed on the back of that news. Coming back to some of those main stories yesterday. In Turkey the August CPI print came in a shade above expectations at 17.9% (vs. 17.6% expected) but more significantly jumped a full two percentage points from July and to a new 15-year high. Our economists in Turkey noted that there were signs of general upward pressure across most sub-components owing to the unprecedented FX shock as well as higher utility tariffs. Also worth noting was the climb in producer prices with PPI jumping to 32.1% from 25.0% and also the highest in 15 years. The outlook for Turkish inflation doesn’t look like getting positive anytime soon with our economists noting that a new shock is scheduled to arrive in September in the form of a 15% and 9% rise in electricity and gas prices respectively. Our team have a 19% forecast for CPI by year end with single digit inflation unlikely any time soon (or at least until 2023). Accompanying the CPI print was an unusual short statement from Turkey’s central bank stating that the “monetary policy stance will be adjusted at the September Monetary Policy Meeting in view of the latest developments”. So a hike in 10 days’ time appears a given now and our economists expect this to be in the magnitude of 425bps for the one week repo rate, pushing the rate to 22%. So with economic growth likely to slow meaningfully a great stagflation shock is looking more and more likely and it’s hard to see the newsflow out of Turkey dying down any time soon. Rivalling Turkey for column space however is Argentina. Yesterday President Macri announced that the country was to impose taxes on exporters and aim to balance its budget a year earlier than previously planned. As another measure to cut spending, around half the current cabinet ministries will be cut. As noted earlier those measures did little to stem the collapse in the Peso again which has now weakened 51.61% YTD. Argentina’s main stock market also shed -1.66% after rallying in the few days ending last week. It’s worth noting that IMF Director Christine Lagarde is due to meet Argentina’s Treasury Minister today to review the details of a loan agreement from the IMF so we might well see more headlines as the day progresses. In contrast to the EM turmoil yesterday’s PMIs in Europe were at least slightly more stable notwithstanding a bit of country divergence. The final Eurozone manufacturing reading was confirmed at 54.6 and unchanged versus the flash. Germany was revised down 0.2pts to 55.9 and back to the recent June low while France was also revised down the same amount to 53.5, albeit still a three-month high. Spain printed at 53.0 (vs 52.5 expected) however the big downside surprise came from Italy which came in at 50.1 (vs. 51.2 expected) and down 1.4pts from July. That’s a two-year low for Italy while the output index actually dipped into contraction territory at 49.4. Forward-looking components like new orders paint a picture of further softness ahead too so signs that the uncertain fiscal outlook is spilling over into Italy’s manufacturing sector. Staying with Italy, yesterday was another day with a slow trickle of budget related headlines. 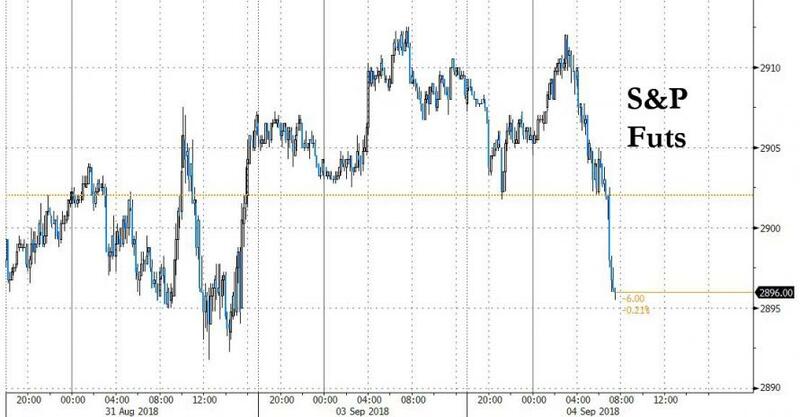 Reuters reported in the afternoon that Economy Minister Tria was pushing for a budget deficit below 2% which contrasted to Deputy PM Salvini’s weekend comment about “touching” 3%. Salvini then said yesterday that the budget would respect “all the rules” which appeared to be a much softer tone compared to his weekend comments. Clearly there is still plenty of noise around the subject though especially as we tick down to the deadline at the end of the month. Senior League officials are meeting with Salvini today about the budget so it’s worth looking out for any headlines on the back of that. Here in the UK, as well as the various Brexit related headlines which seemed to be doing the rounds, namely the comments from the EU’s Michel Barnier on the weekend and former foreign secretary Boris Johnson, there was also a bit of back and forth concerning BoE Governor Mark Carney. A government spokesman was quoted as saying that “the Governor has said that he intends to step down in 2019 and that is still the plan” which is contrary to a BBC report suggesting that Carney might stay on. Carney is speaking to lawmakers today so it’s a topic that could be addressed this afternoon. To the day ahead now where this morning it’s pretty quiet for data with the July Euro area PPI print the only release of note. There’s a number of potentially interesting releases in the US this afternoon though particularly in the manufacturing sector with the ISM manufacturing print for August (57.6 expected) and final August manufacturing PMI due. July construction spending data is also due while August vehicles sales data will also be out at some stage. Away from the data the BoE’s Carney is scheduled to testify before lawmakers this afternoon on the August inflation report and policy decision. Also potentially interesting is a possible town hall meeting featuring German Economy and Energy Minister Peter Altmaier who may discuss Europe and US relations, Brexit and China. It’s worth noting today also marks the day that the full US Congress returns.